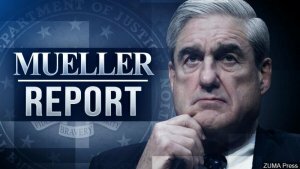 Last Friday, March 22nd, Special Counsel Robert Mueller's investigation came to a close with his delivery of the final report to Attorney General William Barr. The outcome of the federal investigation has been among the most anticipated in US history, and has haunted both the President and the public since the beginning of Trump's presidency. 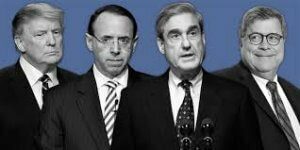 The scope of the Special Counsel's investigation included: The Russian Government's election interference and hacking, Russia-US conspirators, WikiLeaks, Middle Eastern influence, Paul Manafort, Trump Tower Moscow, financial fraud, campaign law violations and obstruction of justice. Mueller, who served as Director of the Federal Bureau of Investigation (FBI) from 2001 to 2012, led a team of 19 lawyers and 40 FBI agents, intelligence analysts, forensic accountants and other professional staff. Over 22-months, they issued 2,800 subpoenasa, 500 search warrants, 230 orders for communications records, and conducted 500 witness interviews. 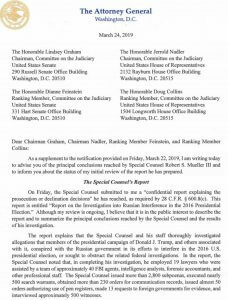 On Sunday, March 24th, Attorney General Barr released a four-page "initial review" of the Mueller report, addressed in a letter to the leadership of the US Senate and House Judiciary Committees. Barr's conclusions were written in consultation with Deputy Attorney General Rod Rosenstein, and references some quotes from the report itself, which is divided into two sections covering election interference and obstruction of justice. Barr states the Special Counsel's report concludes that Russia interfered in the 2016 presidential election, documenting in detail the actions and "crimes committed by persons associated with the Russian government in connection with those efforts." On conspiracy, however, "The investigation did not establish that members of the Trump Campaign conspired or coordinated with the Russian government in its election interference activities." Barr indicates that the Special Counsel's report provides a "thorough, factual accounting" of the president's actions that could potentially be construed as obstruction of justice. "The report sets out evidence on both sides of the question, but leaves unresolved what the Special Counsel views as 'difficult issues' of law and fact concerning whether the President's actions and intent could be viewed as obstruction." In the report, however, Mueller is clear that he is not exonorating Trump. Barr goes on to say, in the absence of "any legal conclusions" by the Special Counsel, he and Deputy Attorney General Rosenstein concluded, after review of the report, that the evidence provided was "not sufficient to establish that the President committed an obstruction-of-justice offense." Barr had been publcly critical of Mueller's work prior to becoming AG, but refused to recuse himself. The reaction to Mueller's decision to forgo a conclusion on obstruction, and the Attorney General's decision to make one, was met with swift public outcry. 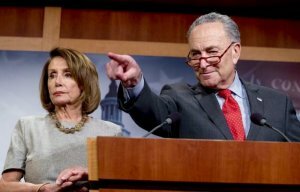 On Monday, In the US Senate, Minority Leader Chuck Schumer (D-NY) called for a vote on the Senate version of the bipartisan resolution that passed the house 420-0 March 14th, requesting release of the Mueller investigation's full findings. A vote, however, was blocked by Senator Majority Leader Mitch McConnell (R-KY). In the US House, six Committee Chairs sent a letter to Barr, calling for the release of the full report by next Tuesday, April 2nd. President Trump's legal troubles, however, are far from over. While the Mueller investigation was limited in scope to Russian involvement in our elections, the ensuing results triggered numerous other federal investigations that are still ongoing in New York, Virginia, and Washington, DC. Pelosi and Schumer call for full report and underlying documentation. "Given Mr. Barr's public record of bias against the Special Counsel's inquiry, he is not in a position to make objective determinations about the report." In addition, these are at least seven separate congressional committees that are pursuing their own investigations into President Trump's campaign, inaugural committee, charity, businesses and administration. Regardless of the outcry, the first publc version of the Mueller Report is likely to be highly redacted -- as some of the information may be protected as confidential grand jury testimony or classified under executive privilege. The reasoning behind Mueller's decision to withhold a final conclusion on obstruction is among the many unanswered questions, although some speculate that his intention was to have that conclusion drawn by Congress, not by Barr. Some answers may be revealed sooner than later. House Judiciary Chairman Jerrold Nadler (D-NY) has requested a date for Attorney General William Barr to testify before his committee on the Mueller report, and Barr is already scheduled to testify before the House Appropriations Committee on the department's 2020 budget on April 9th.